Storey Publishing, LLC, 9781580174459, 128pp. 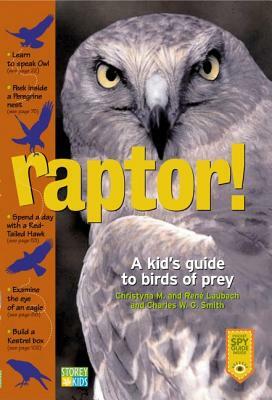 Explore life at the top of the food chain with this exciting look into the world of raptors. This fun activity book immerses children in vulture culture, hawk talk, and owl prowls as they learn about the behavior and hunting strategies of these fascinating birds. A removable “pocket spy guide” will help kids identify raptors in the wild, while breed profiles, flight silhouettes, range maps, and real-life stories will satisfy even the most voracious raptor enthusiast. Christyna M. Laubach is a high school science teacher in western Massachusetts. She is the co-author of Raptor! Rene Laubach has served as Director of the Massachusetts Audubon Society's Berkshire Wildlife Sanctuaries since 1985. He is the co-author of Raptor! and lives in western Massachusetts. A former horticulturalist for White Flower Farm, Charles W.G. Smith has also been an instructor of vocational agriculture. He has written about gardening and environmental issues for more than a decade. He is the author of The Beginner's Guide to Edible Herbs, The Weather-Resilient Garden, and Raptor!